Are you looking for some fancy embroidered kurtas? latest style kurta’s for men? Then this blog post if for you. Outfit trends bring 12 trending kurtas for this season.A kurta is like kameez worn on the upper body and it can be paired with churidar pajama or a shalwar. It can also be worn with a plain trouser. Kurta’s usually have a round neck. They can be quite formal at times depending on what material they are made up of. Casual kurta’s are not decorated where as formal kurta’s might include bed work and embellishments. Before men never used to show much interest on their look and clothes but with time and living in a modern era men have started taking interest in their clothing. Their way of shopping and selecting has changed. Men seem much interested about their appearance.When it comes to attending events or parties. Asian men in India, Pakistan and Bangladesh prefer wearing fancy kurtas. Embroidered kurtas are in trend now a days. They are available in the markets and can also be made on order. Variety of designs and colours are available in different fabrics. Fabrics such as silk, cotton, and mercerized yarn. Kurta designs are also available on the online sites from where you can buy them and have them delivered in your house. Different dress designers launch their collections every season. There are various suiting collections that they launch every year. 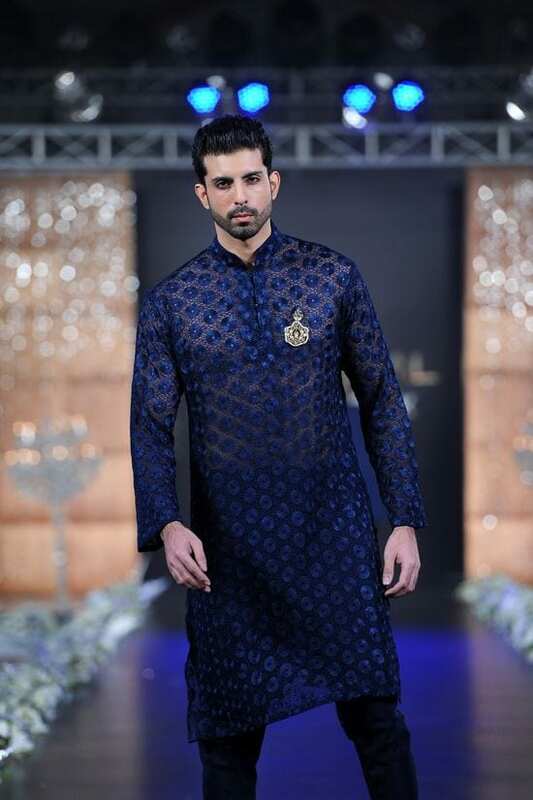 Mostly men prefer wearing simple embroidered kurtas or fancy kurta kameez on events. Embroidery work is common these days on the dresses, Beautiful stone work is done on the collars and around the sides of the kurta’s and they can be found on designer boutiques as well.Loose fitted kurta’s are more fashionable and stylish. One can give a custom order for kurta with their choice of embroidery and buttons of different styles. This will add grace to the kurta. Silk and cotton kurtas are very trendy and comfortable to wear. There are variety of styles available in kurtas. Kurta is a perfect dress for every men who want to dress up for an event or occasion. There are different stitching styles of kurta’s, tailors select the stitching style that is according to the new fashion and trends.All the designers around the world are making different clothes and other accessories for men. In this way men now are also becoming conscious about their dressing style.Here are some pictures of embroidered kurta’s which asian men wear on special occasions. These kurta pictures are according to the most recent fashion trend of the year and you will get enough idea about the latest men’s fashion wear. Below are some pictures of the men kurta’s that are fancy and can be worn on a desi party. Men and young boys prefer wearing dark colors such as yellow, green, red, purple, turquoise etc. Have a look at the different designs that are trendy and stylish to wear. Hope all the men reading this post will get aware of the most followed designs and kurta’s.